Charge your Samsung Galaxy S8, S8 Plus, S7 Edge, S7 and S6 quickly with the official wireless fast charge stand in black. Allowing you to charge up to 1.4x faster than traditional wireless chargers, this really is the perfect accessory for your new phone. Really competitive price for a genuine Samsung fast charger. Works perfectly as expected. Smart design and fits well on desk but would not look out of place in other locations. Delivery was really quick as well. Great just what was needed I plugged it in and hey presto ! my phone with its broken port charged up straight away. So good I am ordering 2 more for family. Best price around. How good is this thing! Looks sleek and neat, charges efficiently, and no messing about removing covers, trying to make good contact or positioning the phone carefully. Just pop it on and away it goes. SPLENDID STUFF. I think mobilefun is a great place to order products for phones. Reasonable prices and excellent selection. This is the third one of these I have bought - they just work. So simple - no faff, and they look the part sitting on a desk or at home. What's not to like - just do yourself a favour and buy one! I am very satisfied with the purchase of the Samsung fast wireless charger. It works great and charges my phone quicker than I had anticipated. The picture shows a cable but amazingly this comes without it. Cheapskate Samsung. The charging stand is very convenient and charges efficiently. I like the angled base as it means you can use the device hands free whilst it is charging. For example if whatsapping you can have a conversation without holding the device. It's a very handy thing to have as I can still charge my Samsung S6 which has a damaged USB port and cant be charged any other way.However, It did not come with a micro usb cable. This product does exactly what it is designed for. It is faster than I expected based on Web reviews. I personally give this product a high recommendation, it is a must have item that not only charges your phone but enables you to use it as a stand. Does exactly what it says on the tin! Good value at the discounted price, Be aware it needs a fast charger and cable to work. Fantastic product that works as it says it does. Just plug it in and rest your phone on it to charge. Works great, have it sitting on my desk so whenever i am in the office it is charging my phone, no plugging and unplugging of cords required. The only thing I didn't like was the fact it never come with its own power cord included, had to buy a second cord so i could leave my other at home. Great product, Great build quality but than again I wouldn't expect anything less from Samsung. The only issue I had was that it didn't come with a Micro usb to plug in the charger that's why I only have given it 4 stars. it works, as described, probably better. galaxy S7 wrapped in an Otterbox Defender case. At first I thought the case was stopping the wireless charger from working. With persistence and careful positioning of the phone on the charger the charger works fine with the phone in the case. Easier than plugging and unplugging cables. Positives: Really like this product amazing white looks so smart on my office desk. Easy to use. Negatives: it dont come with a usb lead so I couldn't use the product straight away. Also If you wanted to put this next to your bed the blue led light while its charging is really bright it will faintly light up a dark room. Works well, but no cable. It's annoying to need to buy another Fast Charging cable, since this website is sold out. It should come with one. Bought wireless fast charger as my Samsung charger socket has broken and I refuse to pay £100+ for a repair. When I figured out I have to restart my phone each time for it to fast charge I was quite happy with it's performance. This is an excellent product, a real time save. The charging is fast and I don't have to deal with wires anymore. Good quality charger that does what it says on the box! Fast charging is fast. Great item for a quick charge of phone, And very convenient,I like it. Great item for a quick charge of phone, And very convenient,I like it.and that I don't have to keep on plugging a cable in the phone to charge . Really quality charging unit, & have it plugged in all the time so that I can simply put fone on device whenver i chose & it charges really quickly, especially if I turn my data off. It's quite a compact unit also so doesn't take up too much space. Its original Samsung charger. its fast Wireless charger. Purchased the charger for my Galaxy s7 edge, works great and such a simple thing to use!! I bought it because my phone decided to play up and not charge on the cable. The only thing is i wouldn't really call it a fast charger probably takes twice as long as using the cable but still works as it should. Delivery was quick and product came perfectly in tact, genuine product for a good price. When I received my Samsung Galaxy S8 and discovered that wireless charging was a feature, I immediately searched for a genuine charger. MobileZap had this one and it works great. With the correct fast charger plug, my S8 is charged in super fast time! Biggest plus is the USB-C port doesn't get touched/damaged. Customer service are very good. One of the item I received was damaged during the delivery. I had to wait a while to get the first answer from the costumer service but after that everything went smooth and quick. Will buy again. Fine for few months., then charging paused will come up., google it many remedies that dont work., be quick to teturn product as mobile zap have a strct 12 months warrenty on all products sold. Great charging unit. Very convenient to drop my phone on. No plugging in. It looks and works brilliant. I return from shift in the middle of the night and used to struggle to plug in my phone in the dark without waking my wife. With this you just put the phone on and off it goes. The only drawback is the fan that runs whenever it is fast charging. The fan stays off once the charging is done. It isn't too loud but as these are probably going to be used next to people's beds, this could be an issue. The fan sounds like a radiator when your heating is on. Very good service, with the device I wanted arriving in good time and in good order. Great service. Happy to recommend to friends and family. Delivery was quick and well packaged. Stated that it was quick charge... quicker using normal charging cable. I usually charge overnight so there's no need to fast charge. Sleek looking product. The product is good enough, but the fast charging isn't all that quicker than the original way which is the reason I purchased it. The item does not come with a power cable, but your charging cable will work, so theres no need to buy one. Delivery was quick. The product was well wrapped. Yet again I would recommend this site. Fast shipping excellent price and works great. No more needing to plug in the phone cable! Bought this to use on the desk as the 'stay at home charger'. It works flawlessly, looks good and it can be seen at a good viewing angle while charging. Perfect! This is just what my husband was looking for. So easy to use just plug it in then put your phone on it and it charges it super fast. Great product and good value. The Samsung last generation quick charger works as advertised. The charge port is micro USB not USB-C, but still charges. Only caveat is if phone charge is less than 40% or so it will either take 4+ hours OR it will not completely charge the phone at all. This may be since not using Samsung charger, but my after market charger whose output is a bit more than Samsung's. Still this should make no difference. If charge of phone is 50% or more before placing on charger it will charge completely then continue trickle charging until removed next morning or a few hours later. This looks great on my bedside table even without the phone on it, doubles up as an alarm clock as well as charger. The charger works flawlessly, I was surprised at how quickly it charges the phone. My only gripe and it is a relatively small one is that the status LED on the front is quite bright, especially at night. Wasn't sure about the unit as it appeared not to charge as fast as I'd expected. I looked for comparison with non-genuine product, and this unit passed on all key indicators - so I am convinced it is the real deal. The unit does indicate "fast-charging" but I have to position the phone carefully as it has a hard shell case with a metal lever in the case (rear prop). The convenience of not plugging in the cable is great - especially if you use it at work and leave your work area often. BTW shipping was fast and tracked - so overall very happy. Would have had 5 stars if power adapter was included. Great item I can tuck the wire to the charger out of the way from my cat Eddie's teeth! No more chewing on the wire..a must have piece of kit far superior to any other..way to go Samsung! It does just what they said it would. Easy peasy. Even my dad could use it without any hassel. The Samsung Wireless charger/stand is a great device. I can just plug it in on my desk. Anytime my phone needs to be charged, I place it on the stand. Quick. No messing with cables etc. Fast charging. Great device. recommended to all Samsung Galaxy S8 users. Great product. Works as it is supposed to and charges wirelessly without any issues. Excellent value for money. Charges about three times faster than by charge cord. No evedence of over-heating - or getting hot at all really (heat is what kill batteries). Really recomend it. Would definitly recomend this Genuine Samsung Charger as opposed to other cheaper aftermarket ones - you dont know what electrical shortcuts they have taken to try and achive the same results as this Genuine Charger. This is an excellent product, I wanted to dispense with pushing in the USB-C connector every time - this is exactly what happens, and as I charge my phone overnight, it is always fully charged by the morning - the indicator lights are a help,too. Just one thing which I should have realised, but as this is an older product, it needs a microUSB connector, which is not supplied - and as I sold mine with my old phone, I couldn't use it until I bought another one as the S8+ uses a USB-C - I could have added one to my order if this was specified . Good value too ! Brought Samsung fast charging stand from mobile fun who were extremely quick to respond to my order and kept me informed through the whole process from order to delivery. orderd on web site the item came well packaged .and within a couple of days. a well made charger very sturdy ,my phone has a protective case and it charges with it on so very pleased . This is a super item for fast charging without the hassle of remembering if I have the right cords available. Though the S8+ comes with plenty of adapters, I wanted to keep them at home, so this wireless charger is perfect for my desk at work. Nifty, neat and necessary! Great invention, great purchase. Thanks! Styish and convenient, but there's no mains charger supplied..
An excellent device, clearly described on Mobile Fun's pages. I've previously shied away from wireless chargers, not particularly liking those that lie flat. Also, I have been dubious about non-OEM equipment. This Samsung charger is perfect for me. It has a lip to hold the phone in place, even with a cover on the phone, and it happily charges my S6 Edge, S7 Edge and S8 Plus ... one at a time, obviously. It's necessary to use a charger that came with your phone - it might have been nice to include one with it, but not a big issue. It doesn't fold flat, as some have observed, so is slightly bulkier when travelling. However, the rigidity the design provides is more important. This is one of the best devices of its type. If you're thinking of getting a wireless charger - get this one. Works as intended and very convenient that it's on a lean. I've bought one of these before, and love the ease of use. Simply keep it on your bedside or desk, and simply place the phone on the stand. It starts charging instantly, and with the Samsung it shows the clock too. Good price from MobileZap, and quick delivery. Pros: Easy to use, addictive, value for money. Cons: None. 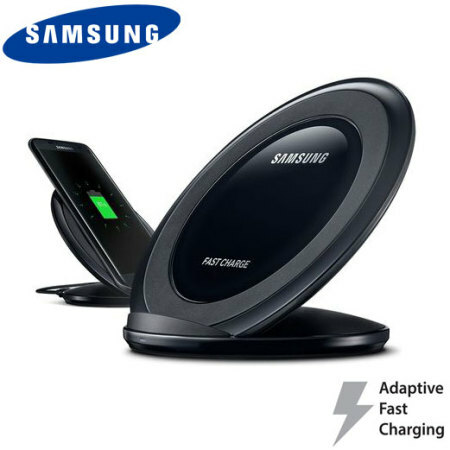 Official Samsung wireless adaptive fast charging stand . Just bought a Samsung galaxy S8. Love the phone and this fast charging stand is great!. Excellent product . Easy to use . Fast charging. No fiddling with wires in and out of my phone ( last phone Galaxy S6, became unstable charging after using a usb wire). Easy to just just pop it on the stand and your done ! Would highly recommend and at a reasonable price too. Very happy with purchase and Mobile Fun are great. Lots of great gadgets !! Ordered the Samsung Adaptive Fast Charging Stand for my new Galaxy S2+ phone. It arrived in Toronto Canada from the UK in about 10 days. I looked around and the price from Mobile Fun was less expensive with shipping and tax than sourcing from Canada or the US. It works well through my Samsung official LED case, (which I also purchased from Mobile Fun and which arrived before my S2+) either vertically or horizontally. A friend also tried this stand with his Note 5 with a fairly thick "S" case and it worked as a fast charger with that phone too. Fully satisfied. As noted in other reviews, it does not come with an Adaptive Fast Charger or cable - just the stand. I knew this before hand so was and is not a problem. No surprise. Unlike the S2 and S2+ which have usb type C connectors, this Adaptive Fast Charger stand has the traditional micro usb connector. Again not an issue for me as I have a number of Adaptive Fast Chargers and traditional micro usb cables which (the cables) are of no use with my Galaxy S2+. The product I received was as expected and arrived in a very short time after placing the order. I would not hesitate to order from Mobilezap again. Love this product. It sits on my night table and allows me to just set my phone on it without having to start connecting things. Because it keeps the phone upright, the phone now serves as an easy-to-see clock for those times when I can remind myself that it's not yet time to wake up. Thumbs up to this product. Item took some time to arrive, however it was all within the advised time frame estimates available on the website prior to making my purchase. 100% worth it considering I got the item at half the price I would elsewhere. I would shop at Mobile Zap again.